Looking to stock up on a rifled slug for your next Whitetail deer hunt? 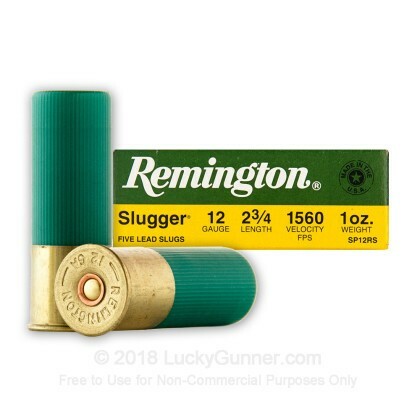 Remington’s line of Slugger shotgun shells is a perfect choice for your next deer, boar or elk hunt. 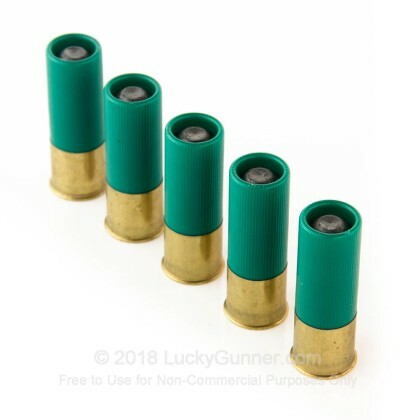 These specially designed slugs feature a 25% improvement in accuracy at longer distances (per Remington’s test results) and are capable of a muzzle velocity of 1560 FPS. 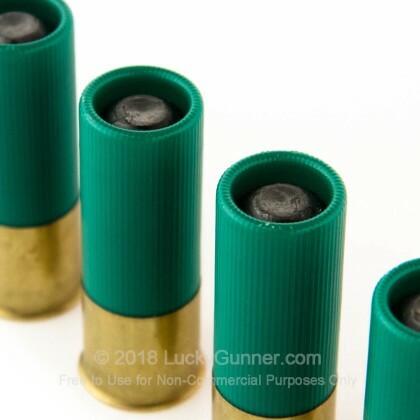 Remington’s 12-gauge shotgun shells feature a 2 ¾” shell loaded with a 1 oz. 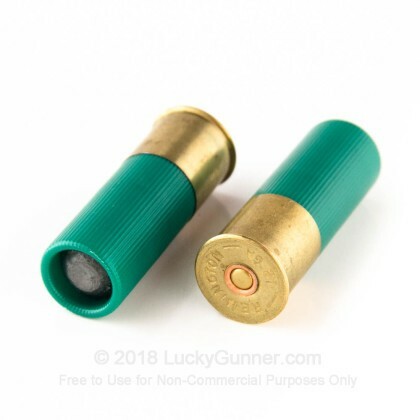 rifled slug and offer terminal performance at ranges longer than a standard rifled shotshell. 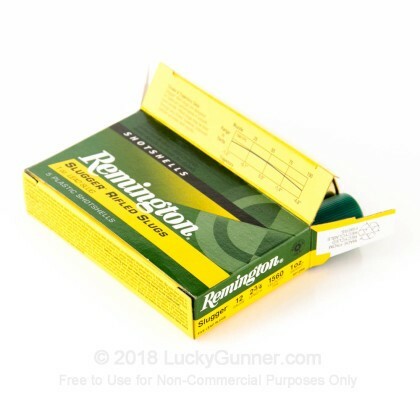 Each box of Remington’s Slugger shotgun shells contains five shotgun shells. This case contains 50 boxes, for a total of 250 shells. Remington is one of the nation’s oldest manufacturers of firearms and ammunition, has forged a reputation of quality and excellence lasting for generations. Whether it be their latest design from the facility at “The Rock”, or a time-tested classic like the Model 700, Remington continues to innovate and produce some of the worlds top firearms and munitions. Shot these rounds thru my Mossberg 500a smooth bore barrel at a 100 yards, they were dead accurate! Wonderful round! I've always run Remington Slugs through my 870 & 1100 and they've been great. I just picked up a DP-12 and I'm sure these will be perfect in it also. Can't beat Remington quality and Lucky Gunner pricing and service. Remington is the top of the line. Am a retired Suffolk County NY PD Officer 36 years. This product is efficient reliable and the customer service from Lucky Gunner was outstanding and fast. Great product ... Great service ... Great price ... I will be back ! Q: What do you mean by "rifled" slug? A: It is a shotgun projectile having a round nose, a hollow base and sides cut with a series of oblique grooves. The "forward weight" design of the slug provides the accuracy of the projectile, while the grooves allow the design to be longer to add stabilization. We also have this 12 Gauge - 2-3/4" 1 oz. 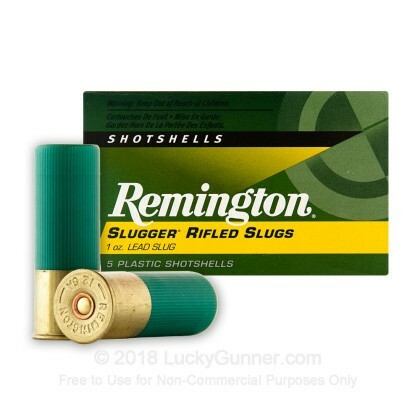 Rifled Slug - Remington Slugger - 5 Rounds ammo in stock in a smaller quantity.